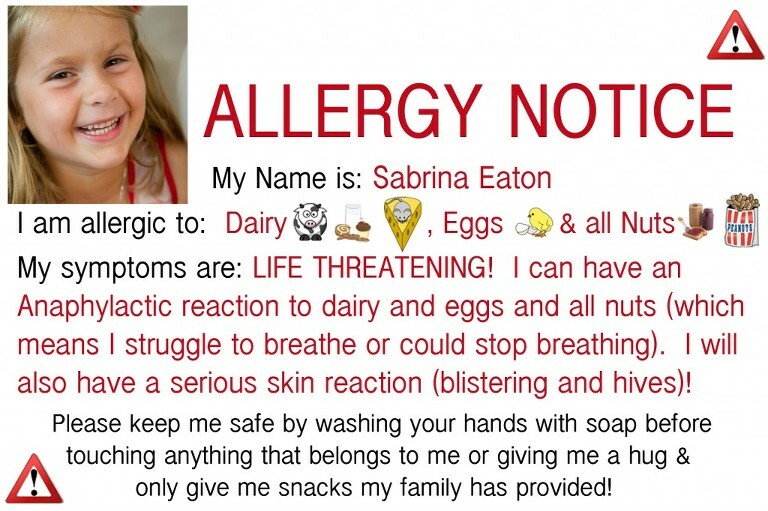 Image of a letter about food allergies. For those of you who followed my food allergy thread on Facebook the other day … and those of you who helped me with not one, not two but all three drafts of my letter … you*are*awesome and I thank you from the bottom of my heart! For those of you just joining the program … I posted what I thought was a simple question about food allergies as a status update … and it turned into a great discussion (65+ comments). I wanted to know what people who have kids without any allergies wanted to know about kids with life threatening food allergies (I am working on a letter for the parents in my classroom). Most of my best friends have been around Sabrina and her food allergies for so long that I couldn’t really ask them because, well, they have either witnessed a reaction, or been on enough play dates to know what is or isn’t safe to have around. So, I wanted fresh thoughts from people who aren’t around kids like Sabrina regularly. and sooooo many people either called, texted or wrote me on facebook asking how the school did today. And so far — I’d say, excellent. I made three of those signs above (color printed and laminted) … and the teacher put one on Sabrina’s desk, one outside the classroom and one at the lunch table. The lunch monitor (who happens to be a new friend) called to let me know things were a-okay and two other moms sent pictures on their phones while she ate lunch. They were beyond protective today … and I hope the same level of protectiveness continues. She is carrying her own epi pen (I had to sign a specific form for that to be allowed) and the nurse also has an epi pen. Anyway … I’m truly grateful for all the opinions and thoughts and to everyone helping keep our Sabrina safe! PS: To see pics from Sabrina’s first day — see the post below!